Regular readers of Revert to Saved may remember that I’m Contributing Editor to Future Publishing’s rather fab Tap! magazine. The title is dedicated to iPhone, iPad and the iPod touch, and I’m responsible for its games section. For issue 5, editor Christopher Phin tasked me with writing a cover feature about iOS gaming, covering the best available games, what games designers think about the platform, exploring kit, and offering the odd nod to retro-gaming. Designer Chris Hedley then created one of the best covers I’ve seen on a consumer tech mag, featuring a ton of iOS gaming characters. 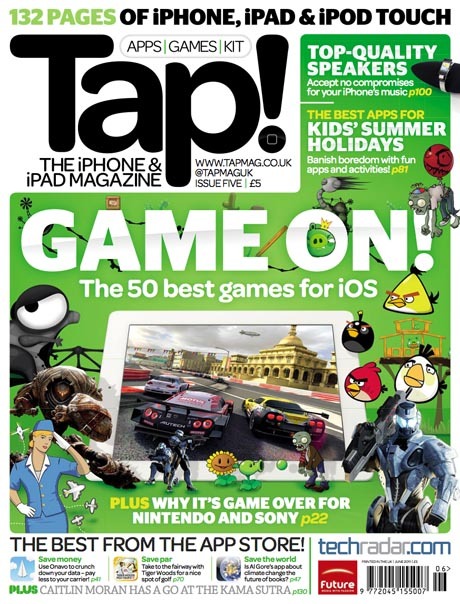 The magazine of course also includes all the usual iOS news, reviews, tutorials, features and columns. If you’re a UK subscriber, you should get your copy within the next couple of days (if it’s not already arrived). Alternatively, the magazine should be on newsstands (WHSmith, Tesco and other stores) some time during the next week. June 6, 2011. Read more in: Apple, iOS gaming, News, Tap! Tap! is now going monthly. Issue 4 will arrive in stores on May 12, and then subsequent issues will follow every four weeks. Personally, I’m thrilled at the development, because I know how much passion and effort goes into every page of the magazine. I’d like to publicly thank editor Christopher Phin for his faith in giving me an entire section to play with; also, thanks to each and every person who’s bought a copy of the mag so far, enabling us to now get you twice as much Tap! goodness every year. April 5, 2011. Read more in: News, Tap!